Don’t Forget To Book It! My fabulous Aunt Esther always told me that it’s essential to surround yourself with great books because they are filled with magic and wonder. You really have to listen to a high school English teacher who now facilitates book groups in lovely Greenwich CT. Check her out in action featured in the NY Times. So choosing a place to display your child’s first collection of books is almost as important as choosing the books themselves. 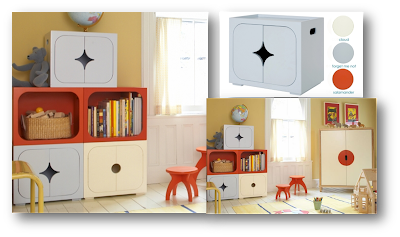 This modern design by Oeuf is sure to hold an expansive library for any little Dr. Seuss fan in the making. Click here for a list of every book the great Dr. wrote! But it’s these adorable little wood Q Collection Stella Star Stackables that have my heart. You can arrange them in many different configurations depending if you want open or closed storage. Add a basket and mix the cool color palette of white, blue and orange to customize the look. The simple design and inexpensive price tag make these a stand out in the nursery. What fun it would be to display nursery classics like Pat The Bunny, Do You know How Much I Love You and Goodnight Moon! This furniture is not only beautifully designed but it’s functional, which is so important when you have little ones who accumulate a lot of stuff. I’m in search of storage solutions for my daughter and I’ll be visiting this site after I hit “submit comment” on this entry.